Franco swears to Jordan and Margaux he didn&apos;t kill anyone. Margaux mentions the licenses. Liz says they were planted the same way Carly&apos;s hair was for Mary Pat and Griffin&apos;s knife was for Kiki. Franco accuses Jordan of using his past to pin this on him. Jordan says he doesn&apos;t have an alibi and his shoe print matches the one they found at the scene. Jordan also mentions "Kevin&apos;s" notes. Scott shows up with an injunction for Franco to have an MRI to see if the brain tumor is back. Spinelli tells Jason he&apos;s been investigating Shiloh&apos;s past, including the incident with Drew overseas. Since then, Shiloh&apos;s done exemplary charity work. Spinelli shows Jason a photo of Shiloh and a woman named Harmony. Spin says the two have been starting DODs in various places. Jason wonders why Harmony didn&apos;t come to PC with Shiloh. Harmony is in Beechers Corners, so Jason decides he&apos;s going to find out what he can about her. Sam drops by DOD to learn more about them. She questions why Shiloh has never settled down. He claims DOD is his family and asks about Jason. Sam angrily tells him to mind his business. Shiloh says they should have a session so they can identify her barriers. Shiloh believes her issues stem from all those who have abandoned her. Shiloh admits that Kristina told him Sam&apos;s past and he&apos;s concerned for her. Shiloh wants her to join them for the Valentine&apos;s Day event to start a new beginning. Julian overhears Alexis making an appointment with her new therapist. Alexis blames Julian for all her conflicts. She heads to the bar and complains to a fellow patron. Alexis spills her guts about her issues with Julian, as well as her drinking problem. The guy asks Alexis out to dinner, but she turns him down. Later, when she heads to the new therapist, it turns out to be the same guy. Ryan questions Griffin about Ava&apos;s whereabouts, but Griffin has no idea. Ryan says he saw them embrace, but Griffin says there is nothing between them. Ryan&apos;s not happy with his answers. Sonny and Kristina have lunch and discuss DOD. He admits he&apos;s seen a positive effect on her. Kristina sings Shiloh&apos;s praises and says she&apos;s found her people. Sonny mentions her own family. Kristina says with DOD she doesn&apos;t have any history following her. Scott says the MRI is to buy time and delay the charges being filed. Liz manages to convince Griffin to be too busy to do it for a few hours. Ava runs into Franco and questions him. Franco swears he would never hurt Kiki because she was like his daughter. Ava pushes, saying Franco was upset with her when she kept Kiki away from him. Franco says he loved Kiki. Ava believes him because he&apos;s telling her the truth. Franco asks her to talk to Kevin and the notes he gave the police. Ava heads out to find "Kevin". Franco tells Liz he doesn&apos;t want to take the MRI because he&apos;s worried the tumor is back. He wonders if he&apos;s capable of the violence, but doesn&apos;t realize it. Liz reassures him. Jordan and Margaux discuss the case. Jordan says Franco had no motive to kill Kiki because his history of killing was related to art. Margaux makes the point about the killings having an artistic flare to them. Jordan feels that it&apos;s too easy because they need more evidence against Franco. She&apos;s worries that if they&apos;re wrong, the real killer is still out there. Ryan decides that Griffin is messing with Ava and needs to be gotten rid of. 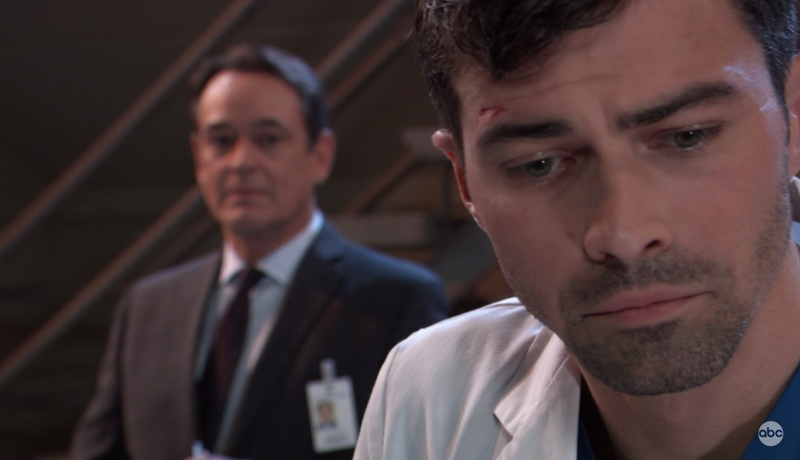 Ryan knows he can&apos;t do much with Franco in custody, so decides that Griffin should have an accident because he&apos;s depressed. Ryan finds Griffin and apologizes for his earlier antagonism. He says he wants to put a brick in the courtyard memorial on Kiki&apos;s behalf. Griffin likes the idea so Ryan says the best way to see the wall is from the roof. The two head to the roof and Ryan has a syringe of something.